The governor of the Tomsk Region Sergey Zhvachkin awarded scholarships and lapel pins Future of Tomsk Region to 26 best students of Tomsk universities. Among them there are 10 students of Tomsk Polytechnic University, this is the best result among the universities of the city. 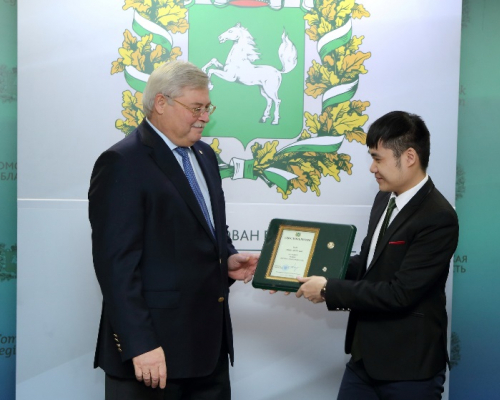 Photo: Governor Sergey Zhvachkin and TPU student from Vietnam Chan Dinh Shon Sho. Credit: Press service of Tomsk Region Administration. The competition for the Tomsk Region Governor Scholarship is held among students with excellent academic achievements over the previous three terms and international students with good and excellent marks. Besides, students’ achievements in research and their participation in social projects and creative contests are also taken into account. This year, the participants received the lapel pins Future of Tomsk Region for the first time. It depicts a nutcracker bird that carries a ‘nut of knowledge’ in its beak with a cone in the background. The governor also reminded that Tomsk is Russia’s only city in the charter of which the city-forming role of the scientific and educational complex is indicated, that Tomsk is an official student capital of Russia and this year it is listed in the top 100 best student cities of the world. TPU winner students demonstrated outstanding achievements both in academic and research fields. For example, a graduate student Evgeniy Boretskiy is engaged in safe storage of hydrogen fuel, a graduate student Valentina Moskvina is studying the impact of hydrogen on steel, she is working on new materials that will be resistant to prolonged hydrogen exposure. A graduate student Alexander Krutey is optimizing a technology for obtaining a biocomponent for detergents. TPU international students from Vietnam Chan Shon Sho and Chan Tuan Hoang also received the Governor Scholarships.